A key to the great prosperity, technological advantage and military supremacy of the United States is the system of global commerce and finance that places absolute trust in the value of the US dollar and the credit-worthiness the Federal Reserve Bank. Essentially the system relies on the willingness of workers and traders especially foreigners to accept the US dollar in exchange for goods and services provided in a promise to pay agreement. In particular fossil fuels are priced and traded in exchange for US dollars, but other commodities as well. The apparent advantage to global commerce is that traders from different countries can compare prices internationally in US dollars and make purchase biddings in the international markets with a common currency. That certainly makes good commercial sense. Before 1971, Troy ounces of gold served as the international index of commodities valuation and bills of currency were convertible to gold without question. The advantage to US businesses and citizens of trading in US dollars is that more value is received than paid. One way of trying to achieve an equal value exchange is if all US Dollars received are immediately exchanged again for other goods and services we need. But in many situations US dollars are accumulated as a guarantee of potential purchases in the future. US dollar credits can be loaned out again at interest to other parties, as in the purchase of shares in companies, simple bank deposits, or loans (bonds) to the government treasury. So, the extension of credits can go a long way in terms of multiple successive loans, all with expectations of returns on investments and eventually a repayment of the loan at some stage in the future. Retirement or pension schemes or savings policies for when your house or shop burns down are good examples. This is particularly unfair when (as usually happens) the exchange value of the dollars decreases because by approved legal process the Federal Reserve Bank can increase the amount of US Dollars moving around the markets. These credits (the US Dollars) are charged to the US government at interest, to be paid by US taxes. The justification of interest is that US citizens are the first to receive the new “cash” and they benefit by having the cash before it loses value while other nations suffer the devaluation later down the line. As the purchasing power decreases, prices are raised so endless cycles of inflation ensue. The world’s populations and commerce can continue to expand (as they do) and utilize the extra cash the Federal Reserve Bank can happily create out of thin air (as they do) and prices can happily go up and up (as they do) and private owners of the Federal Reserve Bank can happily live on the luxury of accumulated interest payments (as they do) which is an extra tax (unmentioned, unnoticed takings) from all the hard labour and earnings of the common people of the world. The system will not come unstuck as long as the amount of goods and services are always available to the markets and that’s where the problem is starting to appear. It has everything to do with the promise to pay. The Federal Reserve Bank made a promise to pay that they eventually will be unable to keep. Central banks of other countries have followed the same example. The promise to pay agreement is based on an assumption that the world’s resources, like oil and gas, minerals, clean water, fish stocks, forests, pastures and arable land are either limitless or renewable at the rate of global consumption. The assumption is that everything we need is out there and free for the taking at any time and all we need to satisfy our needs is the right tools and some time and effort for planting and harvesting. That’s how it was in previous centuries but quite clearly this is a hopeless delusion today. The world’s resources may not yet be running out but they are becoming more difficult to harvest and renew. More people, time and energy for harvesting means that more resources are required to harvest resources. In previous decades government agencies and traders around the world built up stockpiles of commodities as reserves. We are now in a phase where we are using up the reserves to find and develop better equipment and new places to harvest, in remote and dangerous locations. So global stockpiles are not growing to meet population growth; some are even falling. Not only is the harvesting demanding more and more time and energy, but the quality of modern goods and services is deteriorating and no one notices or cares. Like worms eating the very tree they live in, getting bigger all the time and gobbling more and more to feed their fat bodies until the twigs are bare, this is a recipe for disaster that few people seem to appreciate. We see the latest charts showing how global market consumption is now exceeding production for cereals, fishing catches, timber, oil and gas, gold and silver, but prices are not yet rising, so reserves are still being depleted to make up the deficit in supply. We are no longer building to expand reserves, but using up precious resources and reserves in order to harvest precious resources, in a vicious circle. Prices will start rising when reserves start running dry. Until the financial crash of 2008/2009 commodity prices were rising rapidly in response to population growth and industrialization. Employment and prosperity has continued to diminish in degrees after the financial crash, so the global market demand especially within the world’s middle classes has deflated somewhat. Dwindling prosperity relieves the pressure on stockpiles and dwindling reserves for now. To keep price hikes from escalating again, bankers will have to apply new tactics to continue gradually diminishing employment and prosperity, or more wars will be provoked to reduce population growth and redistribute wealth. The credits today (promises to pay) are massive and grossly out of all proportion to the value of goods and services available in the markets. 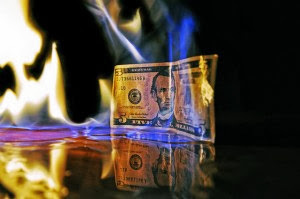 The process of building an impossible global debt is heading for disaster and will affect all those who have been accumulating US dollar credits, or any related currency for that matter. The only thing keeping the game going is government propaganda (in all the major countries of the world) that convinces nearly everyone to continue to put their confidence in the banks, markets and investment funds. But a few clever people are waking up to the fact that they are going to be very disappointed when they come to demand their credits. Some are demanding the promised goods and services (or gold and silver) before supplies become scarce and quality deteriorates even more. It’s already happening quietly; but sooner or later the next group of clever people will notice, wake up to the fact that supply and quality is diminishing and start a trend. Once that happens (and this trend will soon become more visible) the credit system will experience an unexpected, unprecedented demand that the international markets will be unable to meet. Prices will soar. This has happened before on a relatively small local scale many times in the past. Now a repeat on a global scale is inevitable. The whole world will literally be impoverished and turned into batteries of slave workers during the next financial collapse while the bankers and a few clever ones are enriched and empowered. When the rest of the world end up horribly cheated of their hard savings, investments and company shares, the clever ones who woke up early and redeemed their credits will have to head for the hills to escape the anger and vengeance of the others. Alternatively, just before the next financial collapse the clever ones who were outsiders but woke up later than the early birds will plot and conspire to overthrow the US government and arrest the bankers. It won’t succeed as planned but the result will be to justify the full tyranny of a police state in the US and possibly precipitate a financial collapse anyway by highlighting a loss of trust in the Federal Reserve Bank. Another possibility is that middle and upper class members of the world remain oblivious to the extra taxation of the Federal Reserve Bankers and accept that boom times and great parties are over. They might be happy to descend slowly and gracefully into poverty (with no more retirement bonuses) like all the other hard-working peasants of the world. Possible, but not likely! A third possibility is that the US government and the crooked bankers may precipitate a global war that requires a close down of open communication, free market trade and prevent public runs on the US Dollar credit system. That might delay the collapse, but the conflict, destruction and terror of a global war will be as bad as the whole world becoming impoverished without a war. Warning of problems are when either Western governments begin to close down the free alternative media and communication networks and trading markets and banks are often unexpectedly closed for business and price variations become abnormal and senseless. That means the governments are moving to prevent the awakening of the middle and upper classes and attempting to confuse and fragment any empowerment of private outsider competition or threat. Another sign is when economists start reporting low reserves in commodities (like cereals, sugar, quotas of commercial fishing catches, oil and gas, gold and silver) and the prices start rising more or less in sympathy. That means an awakening of the middle and upper classes is taking place and can’t be stopped. Then a global war will be instigated and marshal law in the US as an excuse for the crooked bankers and governors to intervene, fragment any empowerment of private outsiders and forcibly rearrange the global market economy. Not good news. The reason that this story has to end in disaster and suffering for many is that the middle and upper classes in the last few centuries have not had to think too much about the future and where the next meal or party comes from. They have led the campaigns and charges across the world with the motto “In the government and ourselves we trust.” A childlike faith and trust like that is not too bad when the government is limited in its power and technology. But governments today have powers and technology to act like gods and top officials begin to feel and think like gods. Humans have traditionally been well aware that they live or die at the whims and mercies of “Mother Nature” or “the Great Spirit of the earth and sky” so they grew up to respect and cherish the natural realm. But modern man has learned to use powerful technology for altering and subjugating nearly everything in nature to his will and delights. In controlling the natural realm he grows up to believe it’s his right and a necessity to use or abuse “Mother Nature” how ever he sees fit. He has become alienated from “Mother Nature” and forgotten how man has always existed in a symbiotic (mutually supportive) relationship with her and so any harm to one will harm the other. Modern man will have to relearn the secret of life – that to disrespect, abuse and harm “Mother Nature” is ultimately to disrespect, abuse and harm himself. For his carelessness, modern man will unfortunately have to learn the hard way. Ancient seers and sages have predicted our times with incredible foresight. The only solution would be to fly off to another planet with boundless fresh new supplies of oil and gas, minerals, clean water, fish stocks, forests, pastures and arable land free for the taking. That’s logical but unrealistic. Our thinking in commerce, economics, finance and anthropology must be both logical and realistic. A return to harmony with “Mother Nature” will be more logical and realistic. An escape from government tyranny would be difficult but good.